The Late Show ruined Stephen Colbert's interviewing style. Photo Illustration by Slate. Photo by ©2015 CBS Broadcasting Inc.
Stephen Colbert is arguably the best on-camera interviewer of his generation. During his years at the helm of The Colbert Report on Comedy Central, Colbert—in the guise of his vain, right-wing alter ego, “Stephen Colbert”—specialized in creating interrogative disequilibrium. The combination of keen questions filtered through a deliberately fatuous persona often had the effect of throwing his guests off their scripts and eliciting unexpected responses and reactions. The resulting segments were invariably among the best, most interesting interviews on television: relevant, unpredictable, compelling, and funny. So when CBS announced that Colbert would replace David Letterman as host of The Late Show, I had high hopes that he would rejuvenate the late-night talk show celebrity-interview format. Here’s the late-night talk show paradox: Even though viewers ostensibly tune in to see the show’s celebrity guests, the interview segments with these guests are usually terrible. They’re perfunctory (“So I hear you’ve got a movie coming out”) and complacent (“Why don’t you tell us about it”) and characterized by the sort of chattering jocularity that reads as insincerity. Take the self-satisfaction of the Algonquin Round Table, replace the wit with whimsy, and subtract the dignity, literacy, and old-timey hats. That’s the state of late-night interviewing these days, in my opinion. I hate it. To be clear, television executives clearly consider this a feature, not a bug. Late-night shows are supposed to be friendly, nonthreatening environments; otherwise, celebrities would simply decline to appear. And, up to a point, a good interviewer is supposed to make his guests feel comfortable, so that they will loosen up and act naturally. But this enforced congeniality also makes the shows all seem vaguely the same, which to me would seem to create an opportunity for a clever host, like Colbert, to build an audience by doing things differently—by eschewing late-night banalities and bringing some interrogative rigor to the interview format. But for the most part, Colbert hasn’t done it yet. During the first three months of the Colbert Late Show—his first show aired on Sept. 8—there has been a clear stylistic gap between the show’s opening segments, which are often weird and wonderful and memorable, and the interviews, which are far more boilerplate. In fact, many of his celebrity interviews have been surprisingly awkward, while many of his political interviews have been surprisingly tame. 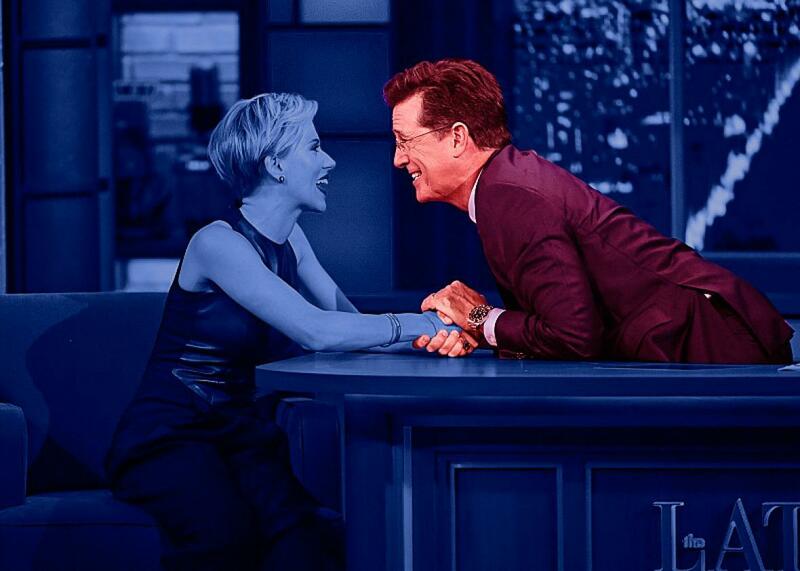 During his first week hosting the show, his interviews with celebrities like George Clooney and Scarlett Johansson were startlingly banal, hinging on unsuccessful comedy bits that seemed designed to camouflage the fact that Colbert didn’t have all that much to say to them. The host almost seemed to be rolling over and allowing Clooney and Johansson to self-promote, which is not at all his usual style. It’s a frustratingly constructed question, if only because it presumes that his guest, given an open-ended prompt to talk about his own past, will actually be interesting. I suspect that Colbert hoped that Stallone would actually talk about his personal connection to the Rocky Balboa character, which might have prompted a good conversation. Instead, Stallone ignored the question part of Colbert’s question and chose to interpret the question’s extended prelude as an invitation to engage in a late-night TV interview standby: to retell old, canned stories. The stories about being a struggling actor who got no respect from casting directors were entertaining enough—they’re good stories, and Stallone is a charismatic guest—but I had also heard them before. The story of how Stallone had to convince the studio to let him play Rocky is classic Hollywood lore. But instead of rerouting him from his standard script, Colbert wound him up and let him go. His political interviews have suffered from similar problems. In his conversation with Massachusetts Sen. Elizabeth Warren, he said: “But you say you’re not running for president. Can you tell us why you’d be such a terrible choice to be president of the United States? Why we shouldn’t be clamoring for an Elizabeth Warren presidency?” That was Colbert’s opening question—again, an ingratiating softball to make his guest feel comfortable. Then came his second question: “How do you unrig the system? If the game is rigged, how do you de-rig it? Do you have to end the game? Do you have to knock over the Monopoly board, and then pick up the pieces?” It was an overcomplicated, overclever question that left Warren feeling comfortable defaulting to what was effectively a stump speech. I am only nitpicking Colbert’s questions because a) they are asked and worded in such a way that it’s clear that he—or someone on his writing staff—puts serious thought into them, and b) his interviewing strategy relies heavily on the questions being good ones. Unlike, say, Conan O’Brien, whose interviews are and were primarily exercises in his own spontaneous riffing, Colbert does not always banter with his guests. Unless the guest is someone whom he already knows, he tends to ask a question, wait for his guest to answer it, and then ask another one. For this interrogative strategy to produce novel and entertaining interviews, the questions have to be good ones and the guests have to actually answer them. And the interviews flounder when one or both of those things don’t happen. In the months that Colbert’s Late Show has been on the air, there have been glimpses, though, of what made his Colbert Report interviews so good: his interrogative toughness, his skepticism, and his knack for unsettling guests while still charming them. Take his September interview with Uber’s Travis Kalanick, in which Colbert seemed determined to make Kalanick acknowledge—if not actually address—the criticism that Uber has received. “I know you talk about how good this is for drivers, but you said you want, like, self-driving Uber cars,” Colbert asked near the end of Kalanick’s segment. “Then that’s not for the driver, it’s just, we’re employing robots at that point. How is that helping, like, livery drivers out there?” Kalanick didn’t have a good answer to the question, and Colbert wisely let his guest hang himself with his own rope, so to speak. The segment wasn’t confrontational—again, this is late-night network television, not The O’Reilly Factor—and it didn’t need to be. Colbert pushed back on Kalanick’s standard script, he threw some curveballs, he asked the right questions, and it was still fun to watch. So when his interviews fizz out, it’s particularly frustrating, because Colbert is perhaps better equipped than anyone to be the one late-night host who does great interviews: He is naturally charming enough to challenge his guests without alienating them. Colbert’s blowhard character on The Colbert Report worked in large part thanks to the actor’s natural charisma. But right now, Colbert seems visibly stuck between the smart, intellectually curious person he seems to be in real life and the idea of a “Late Night Talk Show Host,” who puts everyone on his couch and in the audience at ease—in other words, between Stephen Colbert and the new “Colbert”—who is also a character, a creation of the Network TV Machine.